Many dog parents are unsure of when their fur-babies need their shots. We’re here to help with our handy vaccination schedule. Since puppies don’t come with owner’s manuals, it’s hard to find out when they are of the appropriate age to get their shots in order to keep them healthy for many years to come. While speaking to a veterinarian is one of the first things you should do when getting a new puppy, our list can help you understand that we, as pet parents, must take the necessary steps in helping them get and stay healthy. Use our list as a guideline when consulting with your veterinarian, and you can look forward to a happy and healthy pet for a very long time. Distemper, Hepatitis, Leptospirosis, Parainfluenza, Parvovirus, and Coronavirus is what this vaccination prevents against. The DHLPPC shot comes in four intervals throughout a puppy’s life. The first is when they are between 6-8 weeks old; the second is given between 9-11 weeks, the third 12-14 weeks, and the fourth is between 16-17 weeks. Always check with the vet on whether they need to be revaccinated again or not as they grow. The vaccine Bordetella is to prevent kennel cough. Kennel Cough is a respiratory disease that can affect any dog that is around large amounts of other dogs, such as dog parks, doggie daycare, dog training groups and dog shows. The vaccine is first given when the pup is 14 weeks old, and then every 6 months or yearly. This may vary depending on breed, symptoms if any, and lifestyle, so checking with your veterinarian can help you determine how often your pet should receive it. This vaccination helps with preventing the disease known as Giardiasis, a parasite that can affect the gastrointestinal tract. The first dose should be given at 14 weeks and the second at 17 weeks, then every year after if your veterinarian suggests it. Normally, the rabies vaccine is given at 16 weeks of age the first time. In order to know when rabies shots are required, you’ll need to check the rules in your state pertaining to them and licensing your pet. Of all the vaccines, this is the one that is usually required by law. After the initial dose, your dog will need a booster at age 1. Then, depending on your vet’s recommendation and your state’s requirement, you can either keep getting it yearly or move to a 3-year vaccination. This helps with preventing Lyme disease, which is a tick-born illness. It is not recommended for all canines, so be sure you ask your vet about whether or not your pet should receive it. When given, the first time is at 14 weeks old, the second is 17 weeks old, then every year after. Again, your pup may not need this vaccination, so ask your vet first before letting them administer it. This list contains the main shots that your new pet will need throughout their lives. While some pets may have reactions to vaccines, they are normally not life threatening and are easy for you to notice. Be sure that when taking your dog to the vet to get their shots, you inquire about any possible side effects that may occur and understand what you should do in case of an emergency. Getting your pets vaccinated is one of the first steps in adding this wonderful addition to your family. A pet’s love is unconditional, so be sure that you keep them healthy and show them that same unconditional love. 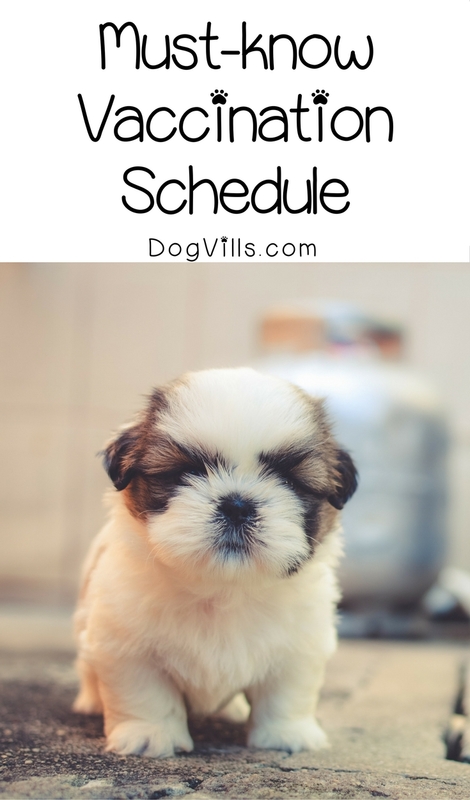 Did you follow this vaccination schedule with your dogs? Do you have anything to add? Share below!